Female lone star tick (Amblyomma americanum), left, shows characteristic white spot. 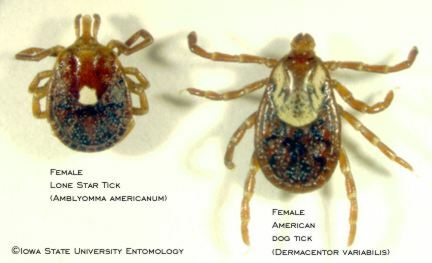 Female American dog tick (Dermacentor variabilis), right, is clearly a different shape. Iowa State University Entomology Department. Last modified June 14, 2001 by John VanDyk.